As you put the finishing touches on your redesigned bathroom, you may feel like something is missing. After installing your shiny new bathroom vanity and appointing the area with new lighting, faucets and other bathroom accessories, you'll need an attractive way of perking up the look of your washroom without breaking the bank. 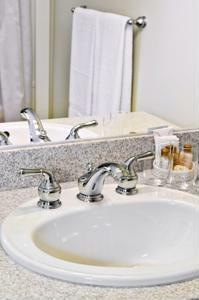 According to HGTV.com, one of the easiest ways to give your bathroom an aesthetic boost is to use a small metal tray on your counter to hold your toiletries. Everything from soaps to cotton swabs to perfume will look much more attractive when they are arranged neatly near your sink. Another aspect to consider is your use of color. Keep your wall color in mind and find some complementary hues in candles, hand soaps and other chic accents. Another tip is to store your everyday items like toothpaste and a hair dryer in a drawer of your bathroom vanity - this can help to free up space on your counter top and make it more inviting for visitors. These handy tips will help to improve the overall feel of your bathroom and help you practice clutter control in your space.